INDUSTRY.co.id - Jakarta - To ensure the supply of fuel during homecoming flow and backlash this year, Pertamina prepares 200 motorists selling fuel placed around congestion-prone areas. Even 40 motorcycles of which serve sales in Java toll lanes. "One motorcycle can carry 50 liters of gasoline motorcycles prepared in the Java and Sumatra homecoming route of about 200 motorcycles to anticipate vehicles running out of fuel while stuck," said Energy and Mineral Resources Minister Ignatius Jonan when reviewing gas stations at the rest Cipali toll road kilometer 102 A ago. 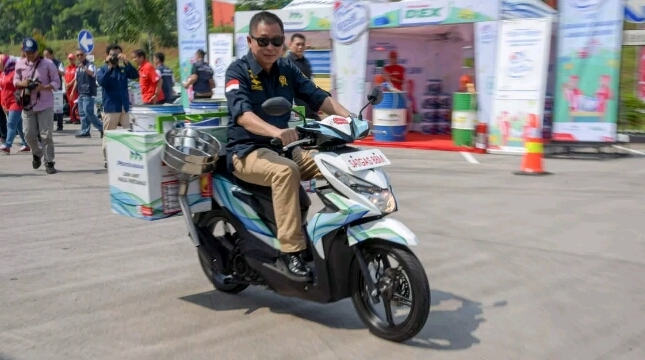 On the occasion, Minister Jonan also had time to try motor fuel seller. In the motor there are 5 drums which each can be filled with 10 liters of fuel. In order to anticipate the demand for premium fuel, there will be an additional 571 SPBU in Java Madura Bali (Jamali) which will sell Premium. "According to the direction of the President's father, as much as possible Premium is provided more evenly, so gas stations that sell Premium will increase from about 1500 SPBU to 2000 more SPBU in Jamali One day a gas station can supply Premiun 8000 liter, that's enough. Minister Jonan. Jonan added that an additional 571 retail outlets selling Premium will be ready for phased operations by June 6, 2018. Gas stations in Cipali km 57A toll road is one of the 7 points of fuel supply facilities in the Jakarta-Surabaya route, which is reviewed by Minister Jonan on Saturday and Sunday. Prior to the gas station, Jonan has reviewed the Cikampek km 57 toll booth and Cikampek fuel terminal. During the visit, Minister Jonan was accompanied by the President Director of Pertamina Nicke Widyawati along with the ranks.